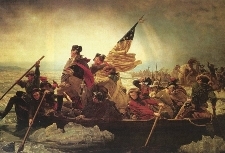 On this day in history, December 25, 1776, George Washington crosses the Delaware River on Christmas Day with the Continental Army on their way to attack the Hessians at Trenton, New Jersey. The attack had been planned in secret and was a hail mary pass from Washington to save the failing American Revolution. After invading New York in August, Washington's army had been driven out of the colony and across New Jersey late in the year. British forces quickly conquered Rhode Island and set their sights on wiping out Washington's remaining forces and conquering Philadelphia, the home of the rebel Congress. After crossing the Delaware into Pennsylvania, Washington had all the boats commandeered for seventy miles up and down the river to prevent the British from crossing. Instead of trying to follow, British Lt. Gen. Charles Cornwallis set up a string of garrisons across New Jersey, ordering the troops into winter quarters. Washington sensed an opening, knowing that the British troops would relax their guard having begun their winter rest. He also sensed an opportunity to revive the flagging spirits of patriots everywhere, who were deeply discouraged with the losses of late 1776. Indeed, British Commander-in-Chief Sir William Howe seemed to believe the Revolution was all but defeated by this point. On the 23rd, Washington informed only the most senior of his officers of the planned attack on Trenton, in order to prevent spies from getting word to the British and Hessian outposts on the other side of the river. On the 25th, the soldiers were gathered at 4 pm and given their orders. The plan was to begin the crossing after dark and to divide the men into three different crossing groups. 2400 men were to cross with Washington at McConkey's Ferry, 9 miles north of Trenton. Another group was to cross over with Lt. Col. John Cadwalader at Dunk's Ferry near Bristol to the south to create a diversion, while a third group was to cross with Brigadier General James Ewing at Trenton Ferry, just south of Trenton. Drizzle fell during the evening of the 25th, but as dark came on and the evening progressed, the drizzle turned to freezing rain and, eventually, to snow. Fierce winds churned the Delaware as the soldiers began to cross on captured boats of every kind, flat boats, ferry boats, Durham boats and others. Soldiers later told of hearing Colonel Henry Knox's deep voice carrying across the river in the middle of the night, giving orders to the boats on how to get the soldiers, artillery and horses across. In the end, Washington's boats were the only ones to make it over safely. 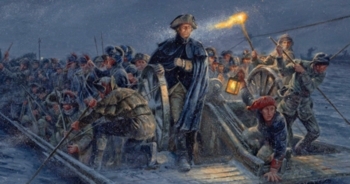 General Ewing called off his crossing because of the treacherous ice and wind on the river. Colonel Cadwalader got many of his men over the river, but brought them back when he could not get the artillery over, only to cross again after hearing of Washington's victory at Trenton and to return again when he learned Washington had taken his captives back to New Jersey. After the crossing, Washington's men captured nearly 1,000 Hessians at the Battle of Trenton on the 26th and returned to Pennsylvania. Within a few days, they crossed back over and turned back reinforcements at Trenton on January 2nd and defeated another British outpost at Princeton on the 3rd. The whole operation forced Cornwallis to withdraw all his southern outposts in New Jersey to New Brunswick, while Washington's army wintered at Morristown, New Jersey. The victories of December 25 through January 3 revived the flagging spirits of the Continental Army and proved that the Americans could stand up to their British foes.